On Friday night Andrew and I ventured into downtown Santa Cruz to catch a movie at the Riverfront Twin. We were planning on seeing 50/50 since we’re Joseph Gordon Levitt fans and Seth Rogen is generally amusing. We eschewed the typical pizza, taqueria, or falafel choices that we usually make and decided to check out a restaurant that’s been around for about a year: Laili. It is located on Cooper Street where I believe there used to be an apothecary, but I’m not certain. They have indoor and outdoor space; we chose to sit outdoors since the weather was nice and indoors was fairly noisy and dark. The patio area is beautiful: ivy growing everywhere, tea lights, etc. The only way you were reminded that you were next to Pacific Ave were the drummers outside of O’Neil’s which quieted down about fifteen minutes after being seated. The waitress got our drinks ordered quickly: Andrew ordered a beer (typical) and I ordered a chai (also typical). Our drinks came quickly and then we ordered our appetizers and entrees. 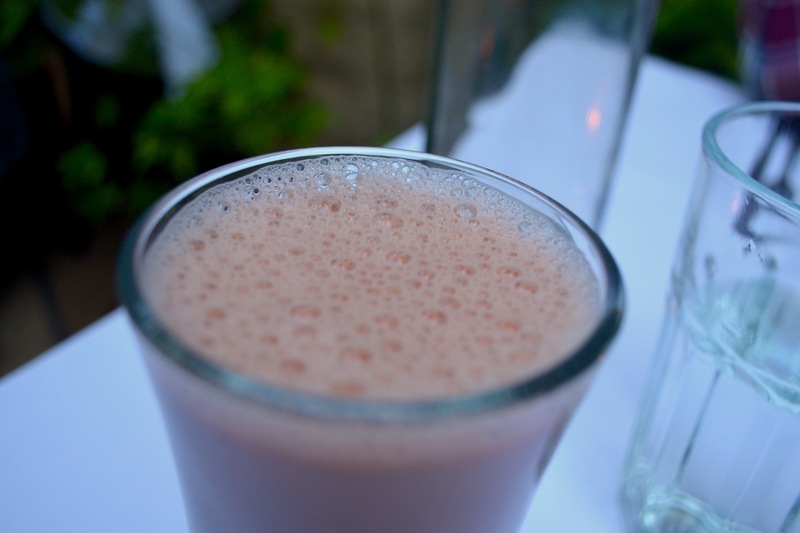 The chai was an Afghan chai, sweeter and not as spicy as Indian chai. It was also pinkish in color. I really enjoyed it and it had these beautiful bubbles on top that I really wanted to photograph. While we were enjoying our beverages, a waitress came by and tried to give us someone else’s entrees. Then another waitress came by and dropped off an appetizer that we didn’t order, but we couldn’t exactly remember the names of what we ordered so we started eating it anyway. 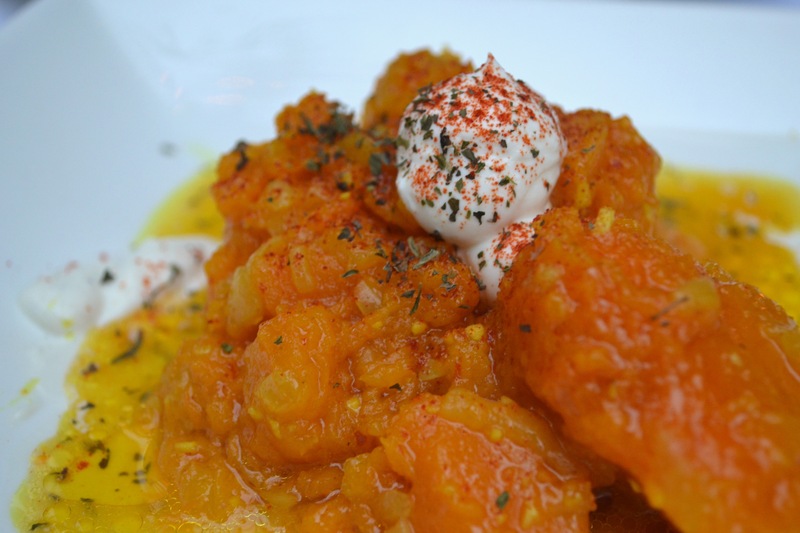 The Pumpkin Boranee is stewed pumpkin, qurut yogurt, mint, and garlic. It was a very pretty dish that sounded good, but the texture of the stewed pumpkin was slimy and stringy. Next came the appetizers that we did order: the Silk Road Plate and the Pumpkin Bolani. 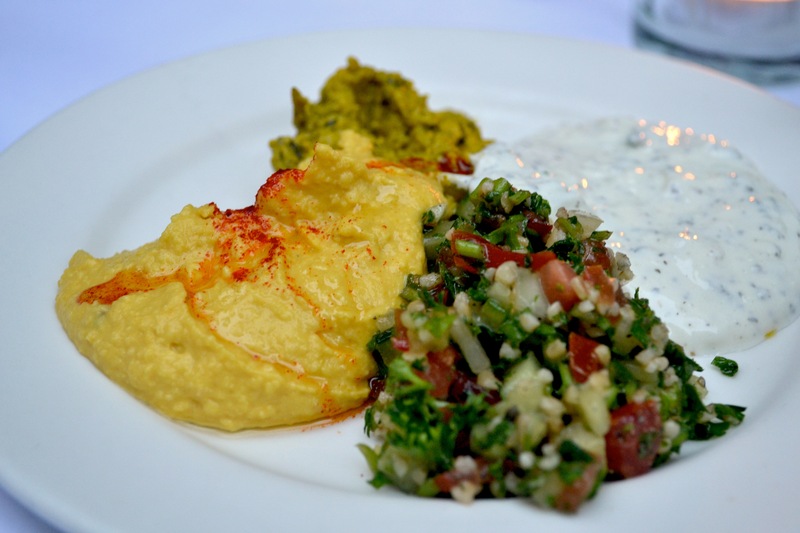 The Silk Road Plate was a selection of hummus, tabbouleh, babaghanoush, and cucumber yogurt dip with “naan”. 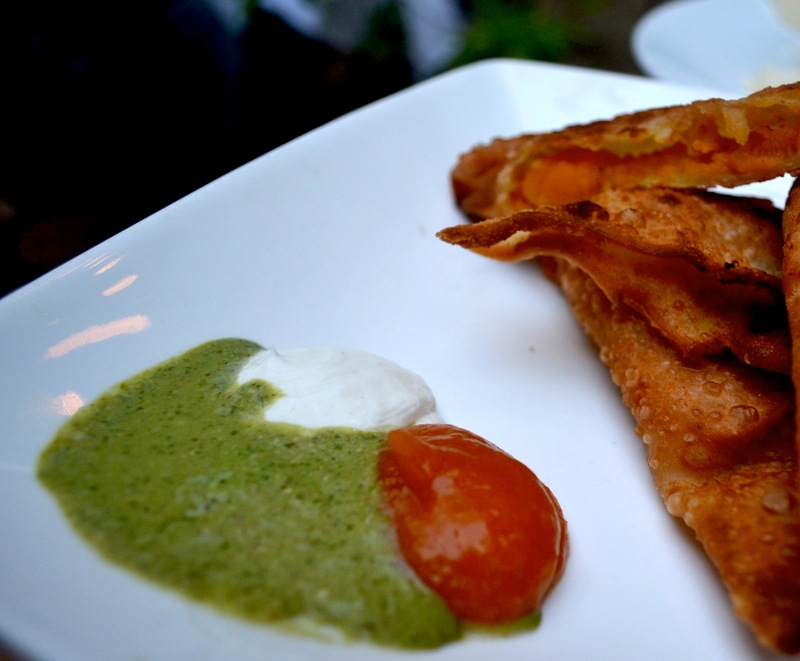 Their idea of naan was not typical of the naan that I’ve had: it was simply a flour tortilla grilled, completely tasteless and not naan. The hummus was good and the pumpkin bolani was absolutely delicious, crispy on the outside and sweet, spicy pumpkin on the inside. Along with our appetizers, we ordered a prawn salad with arugula, fennel, seasonal fruits, and pomegranate vinaigrette. This was a completely overpriced salad with (18 dollars) with about six prawns, the pomegranate vinaigrette that did not taste of pomegranate at all, and maybe about three strawberries. Total disappointment. For our entrees, I ordered Chicken Kabob and Andrew ordered Anar Chicken. 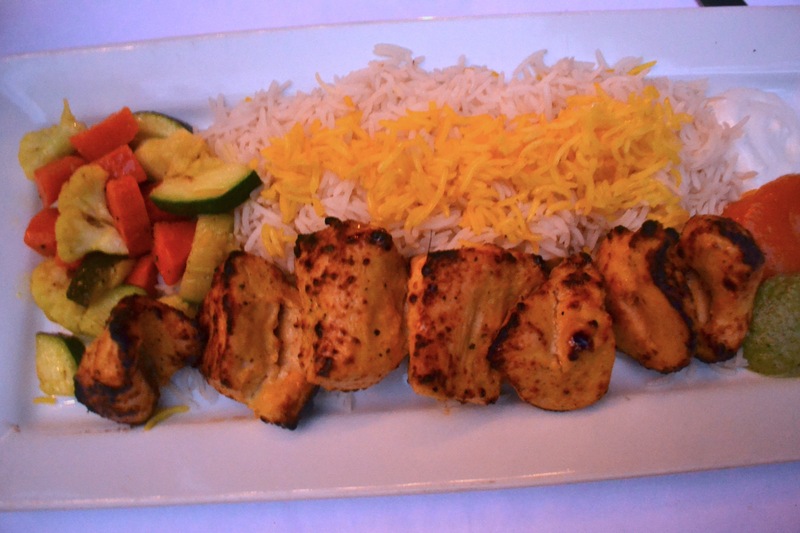 The chicken kabob was moist and tender unlike a lot of chicken kabobs that I’ve had. It was served with saffron rice, steamed vegetables that were overcooked and undercooked (a definite low point in the meal), and several different chutneys that really helped add flavor to the meat which was slightly bland. The Anar Chicken was a half roasted chicken with pomegranate sauce, roasted potatoes, and mixed vegetables. Andrew said it was very good. The service was definitely off. They tried to serve us food that wasn’t ours, served us food that wasn’t ours which we ate anyway, and there was nearly forty-five minutes between being served our apps and being served our entrees. The staff were friendly when they did stop by, but they were simultaneously overattentive and not attentive enough. Overall, the food was good, the service mediocre, and definitely overpriced for the amount of food and quality of that food. This entry was posted in dinner, Restaurant and tagged chicken, pumpkin, Restaurant, rice. Bookmark the permalink.